WHO IS THE NO. 1 BROKER IN ARIZONA? The Verdict is in! HomeSmart outperformed ALL other real estate brokers in Arizona by capturing the No. 1 spot in 2013 real estate volume. The Phoenix Business Journal ranked Russ Lyon Sotheby’s International, Realty Executives, West USA and Coldwell Banker as the 2nd, 3rd, 4th and 5th respectively. I am proud to be a part of HomeSmart’s great success. Choosing HomeSmart as my broker was obviously a smart move. HomeSmart also outperformed ReMax, Coldwell Banker, Realty One Group, Realty Executives, Berkshire, Walt Danley, Keller Willams and West USA in luxury home sales this year. This is a great indication that HomeSmart is successful in handling transactions in ALL price ranges. What distinguishes HomeSmart from other real estate brokers is the value that it provides agents. For a reasonable cost, agents receive knowledgeable broker support, advance technology, educational and networking opportunities and support from seasoned and experienced real estate professionals. Make a SMART move with HomeSmart. We know what it takes to buy or sell a house – our performance proves it! For the full story, go to: http://www.bizjournals.com/phoenix/subscriber-only/2014/07/04/residential-real-estate-brokers.html. The theme speaks to what Chandler has accomplished in recent years and will continue to pursue in the upcoming year. Chandler residents will be happy to know that the city they call home both spent less and earned more than estimated in its 2013-14 budget. Last year’s actual revenue of $180,745,296 was higher than the budget’s predicted $172,019,708. Also, the city’s actual expenses of $180,014,468 were much lower than the approved 2013-14budget of $212,323,477. City officials’ attention to conservative fiscal policies is what makes the City of Chandler able to provide a great quality of life for everyone. Chandler homes remain affordable and offers great value. Not to mention, Chandler was able to continue with major downtown renovations including the construction of the city’s municipal building during the recession. While many surrounding cities were hit hard by the recession and housing crash, Chandler stayed on course with its plan for robust construction. Mayor Tibshraeny noted he is excited to welcome Arizona State University’s Chandler Innovation Center to downtown Chandler. FedEx broke ground on a new distribution center at the city’s Airpark and General Motors is finishing construction on its Technology Center near the intersection of the 101 and 202 freeways. Businesses find Chandler attractive due to its supply of talented, creative and skilled labor at all levels. Chandler is poised to increase job opportunities with the completion of new businesses in the area. Is Adora Trails Community Right for You? Many joyful gatherings took place during the Fourth of July weekend, including the All-American Barbecue Open House on Saturday, July 5th, at Adora Trails in Gilbert. Guests came out to take a dip in the community pool on a hot summer day and enjoyed free hot dogs, chips, soda and ice cream cones. A balloon artist made octopus- and hat-shaped balloons for the kids. An on-site radio station promoted the event and an antique car show was an added attraction. Hundreds wandered in and out of the model homes, and some of them ended up reserving a home. 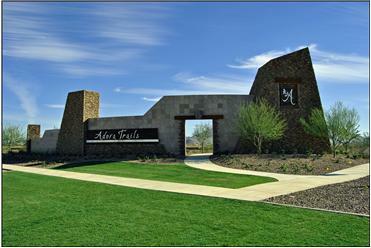 Adora Trails is a huge master-planned community near Riggs and Higley Roads. It borders the Gila River Indian Reservation to the South. Adora Trails features a community pool, a two-acre catch-and-release lake, 12 miles of walking trails, full basketball court, soccer and baseball fields, playgrounds, ramadas, greenbelts everywhere, and a huge clubhouse and fitness center. What makes it even better is having a neighborhood school within the development – Patterson Elementary School is part of the much sought-after Chandler Unified School District. Many young families find that having a neighborhood school brings the families in a community closer together. Developer Taylor Morrison is expecting to build 1,800 homes spread across 16 phases at Adora Trails. Each phase spans roughly 100 homes. At this time, they have sold about 500 homes. Phase One began in 2011; the clubhouse and community pool opened in September 2011. Taylor Morrison captures the essence of home building in four collections with varying styles and sizes between two sales office. The Discovery and Encore collection range from 1,573 square feet to 3,543 square feet, and the Odyssey and Summit Collection range from 2,070 to 4,476 square feet. The Homeowners Association fees are $99 per month. The lot size average for the Odyssey collection is 7,800 square feet. The Summit Collection lot sizes average 9,000 square feet. The Encore Collection average lot size is 6,300 square feet, while the Discovery collection is about 5,700. I previously visited the Adora Trails model center two years ago, and the room was packed with homebuyers wanting to get in on a very good price. Since then, the community has gone through many price increases. I previewed the model homes on July 5th. All of them looked nice and appealing, of course. There were some strange finishes that seemed out of theme in some of the models, but with 27 different floor plans, you are bound to find one that fits your needs. By far, my favorite was the “Everest” floor plan with 4,500 square feet of living space. The custom features, finishes and modern accessories were simply luxurious. Adora Trails is one of Gilbert’s new master-planned communities. The community is situated near the border of the City of Chandler and the Town of Gilbert. If you’re looking for a family-friendly community with outdoor fun and flexibility in location, this is a place you might want to check out. Amenities include community pool and fitness center; clubhouse; two-acre catch-and-release lake; 12 miles of walking trails; full basketball court; soccer and baseball fields. Greenbelts and ramadas abound throughout the property. On-site neighborhood school – Patterson Elementary School is in the highly-thought-of Chandler School Unified School District. Many quick move-in homes and premium lots available. Base price per square foot is generally lower than comparable new construction homes in the area. HOA is reasonably priced considering the amenities. Incentives include first $10,000 of upgrades free and 50 percent off up to $40,000 in upgrades. Plus 3 percent closing cost assistance on the base price for to-be-built homes when using the preferred lender and 3 percent closing cost assistance on the final price for quick move-in homes. The location is far south, away from quick freeway access (it’s eight to 12 minutes to the San Tan Freeway). Standard features at base price are quite basic; it may require $$$ for the most typically desired upgrades. Shopping, retail, groceries further away.